This week, they've released 3 kits - Birds and Patterns, Into the Forest and Many Birds Tree. My card today uses a beautiful image from the Birds and Patterns kit which combines the stamps from the Two Birds Cling set with lots of lovely backgrounds. 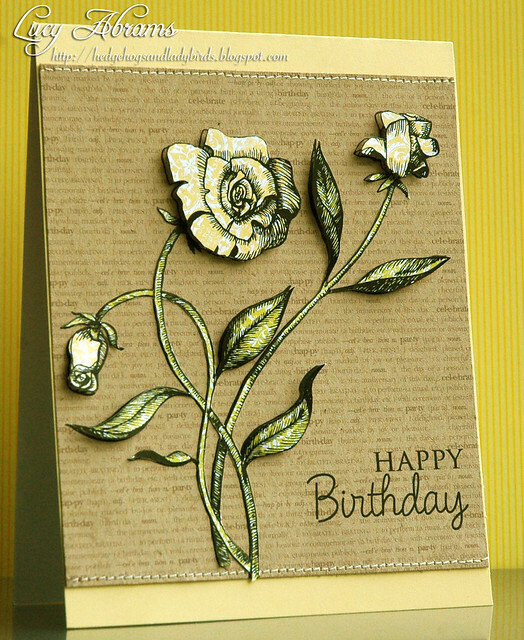 I used the beautiful rose stamp and the fab birthday text border (think I'll be using this a LOT!) then I added a sentiment combined from THIS kit and THIS kit. I paper pieced using papers from the Echo Park Victoria Gardens digikit. I'm drooling over this week's Hero Arts releases! Lucy, this is SO subtle and so sophisticated!!!! ADORE this! saw this on Flickr but didn't realise it was the digi version. Stunning Lucy. Well this could not be anymore gorgeous or elegant..LOVE IT! hugs! Very magical and that rose has always been so romantic looking to me! This card is so beautiful! I love it!